Iraq's rich history, its unique culture, amazing archaeology, and the intrigue of Saddam Hussein, has made Iraq the ideal location for a vacation destination for a growing number of daring tourists. Official figures on the exact number of visitors is lacking but the evidence is that interest in Iraq's historical and Biblical sites is continually increasing and discussions on the internet seem to confirm this report. Biblical sites like Nineveh, Ur of the Chaldees, Babylon, and as some suggest, even the Garden of Eden can be visited in this war torn nation that believes an increase in tourism will help their recovery. 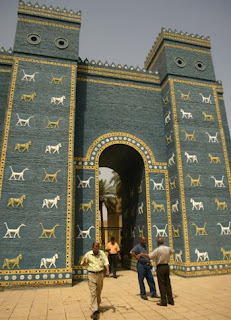 There indeed is great interest by adventurous tourists to visit the Biblical sites found in modern-day Iraq, sites like Ur of the Chaldees, Nineveh, Babylon, and as some suggest, even the site of the Garden of Eden. The Iraqi tourism board is working on a plan to attract tourists from around the world to their nation that is rebuilding and hoping that the financial gain from tourism will enhance the rebuilding efforts. My point is, however, that a major tourism campaign does not fit with the end times prophetic scenario that can be found in Bible prophecy. Bible prophecy, written over the last 2500 years by ancient Jewish prophets, reveals to all students of the prophetic Word of God that Iraq will be a major center - not a tourism center - but an economic, political, governmental power base in the last 3 1/2 years of the 7 year period of intense judgment on the Earth and Earth dwellers. Revelation 18 foretells that Babylon, today's Iraq, will be this world headquarters for the world dictator, the Antichrist, who will control the global economic system to be implemented. A global economic crisis will be the precursor to this scenario (Revelation 13:16-17). Isaiah 13-14, Jeremiah 50-51, along with Revelation 16 reveals the total destruction of Babylon, modern-day Iraq, at the end of the 7 year judgment just before Jesus Christ returns to Earth.